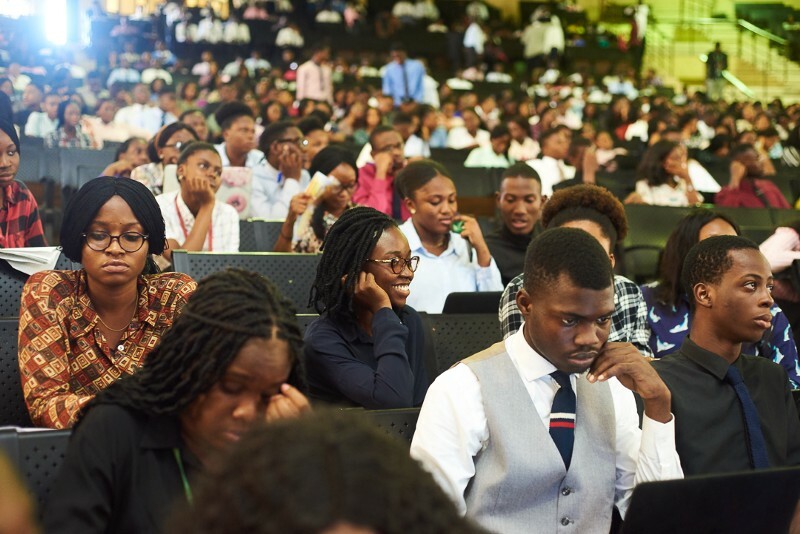 CoinFest Nigeria 2019 conference took place for two days in Port Harcourt (April 4 – 5). Organized by KAYBABS Consult and with support from blockchain and crypto focused companies such as Jelurida, Einstein exchange, Hoard exchange amongst other sponsors, strategic and media partners. The event attracted more than hundred people consisting of bitcoin and blockchain experts, enthusiasts, influencers, investors, start-ups and founders from various industries who came together with the common goal of celebrating cryptocurrency and as well promoting the adoption of bitcoin and its underlying technology. 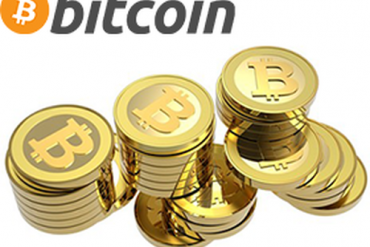 Over the past few years, bitcoin and its underlying blockchain technology have witnessed massive growth. This is evident in how the underlying technology is taking root in top companies in the world. However, despite Africa’s top ranking for bitcoin search related terms, only a few people have solid knowledge about this innovative technology and how it works. 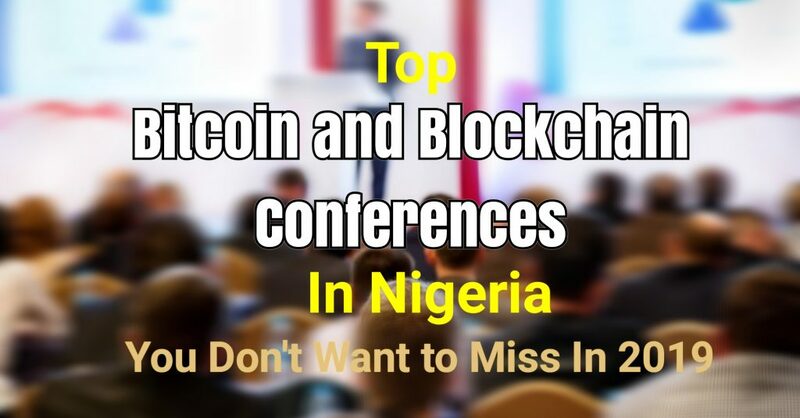 This is why CoinFest Nigeria decided to hold this year’s conference in the far eastern part of the country to educate users, spread the awareness of cryptocurrency and blockchain technology and as same time provides opportunities for attendees to connect and network with blockchain and cryptocurrency influencers and experts in the space. In his opening remarks, the curator for CoinFest Nigeria, Kayode Babarinde, talked about how CoinFest started and how it came to Nigeria. Kayode’s address was followed by a presentation on the mystery of the pseudo-anonymous inventor of bitcoin Satoshi Nakamoto given by Uba Nnamdi, CEO House Africa representing Chimezie Chuta in absential. The conference continued with a presentation from Jelurida lead support Adedayo Adebajo on how Jelurida blockchain solutions enable enterprises to build decentralized applications and services utilizing the Nxt and Ardor technologies. The keynote speaker of the day Professor Nii Quaynor popularly referred to the father of internet in Africa shared an interesting case of Bitcoin; the internet money. 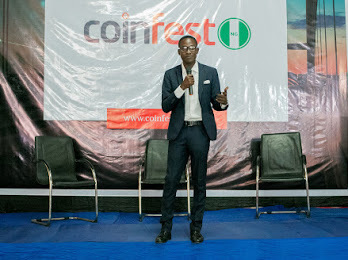 In his opening remarks, the Curator of CoinFest Nigeria, Kayode Babarinde, talked about how CoinFest started and how it came to Nigeria. Kayode’s address was followed by a presentation on the mystery of the pseudo-anonymous inventor of bitcoin Satoshi Nakamoto given by Uba Nnamdi, CEO House Africa representing Chimezie Chuta. The conference continued with a presentation from Jelurida’s Lead Support Specialist Community Manager, Adedayo Adebajo, on how Jelurida blockchain solutions enable enterprises to build decentralized applications and services utilizing the Nxt and Ardor technologies. 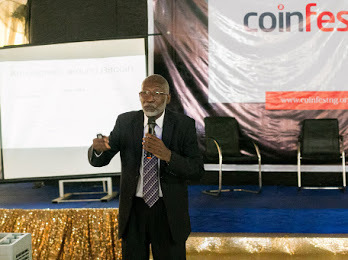 The Keynote speaker of the day Professor Nii Quaynor popularly referred to the “Father of Internet in Africa” shared an interesting case of Bitcoin: the Internet of Money. Professor Nii while delivering his speech gave an interesting comparison between traditional banks, mobile money, and bitcoin noting that this is the first time we have something to do with money universally that has to do with trust. He emphasizes on the need why Africa should get involved in these early stages, creates their own blockchain based solutions and not import them. Furthermore, he calls on African countries to embrace bitcoin and its underlying technology in order to avoid a digital economy divide in the future highlighting what happened during the early days of the internet as a case study. The first-panel session of the conference featured Johnson Nkama CEO, Wibril, Roselyn Wanjiru, EOS Nairobi, and Lucky Uwakwe, COO, Blockchain Solutions Limited. With a topic on blockchain for enterprise; how companies are using blockchain today. While the panelist agreed that blockchain has come to stay and it will affect the way we live and do business, they acknowledge there’s a dire need for educating people about the advent of bitcoin and blockchain. 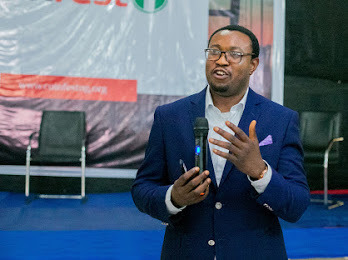 Another Interesting discussion that was held at CoinFest Nigeria 2019 was the rise in cryptocurrency theft, crimes, and scams. This is yet another indicator as to why blockchain education is highly needed. Bitcoin and its underlying technology by default are not inclusive for instance; simply storing bitcoin can be a daunting process for many people. This is one of the challenges the nascent technology has to overcome to gain mass adoption. Adedeji Adewole – Senior Partner for Financial Forensics at A&D Forensics LLC while delivering his keynote speech on Forensic Breakthrough for Cryptocurrency/Blockchain Analytics he noted that cryptocurrency theft from exchanges and infrastructure has climbed to $950 million in 2018, adding that three exchanges have experienced theft or hack in the first quarter of 2019. Dr. Adedeji in conclusion cautions attendees to take the required measures in protecting themselves against scams and theft. He further calls for partnership amongst stakeholders in order to fight crypto crimes and scams emerging from Africa. 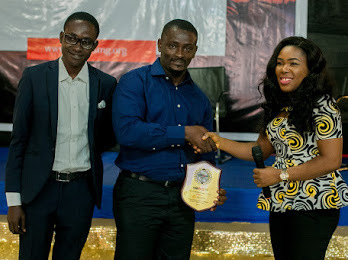 Recognizing the role of pioneers, the Keynote Speaker, Professor Nii Quaynor, was given an Award of Recognition for his pioneering role and contribution to the blockchain space in Africa. Award of Recognition given to Jelurida for their immense support to blockchain in Africa. Swiss-based blockchain company, Jelurida, was also received an Award of Africa’s Best Blockchain Friendly Company, for their immense support towards the development of blockchain and crypto initiatives in Nigeria and Africa. Another interesting panel session which was held at the event focus on the intricacies of cryptocurrency trading and was chair by Stephen Sunday, West Africa Coordinator, Aeternity, with co-panelist: Franklin Peter, CEO, BitFxt, Faith Titus, CEO, eWealthAtlantic, and Faith Obafemi, Blockchain Lawyer. 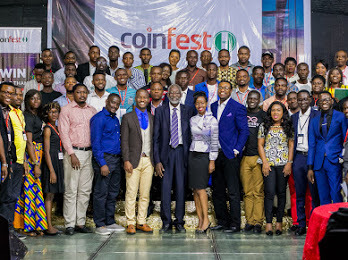 Finally, the day one ended with the launching of CoinFest Nigeria Report with major contributions from all over Africa. The day two kicked off with participants converging at the Knowledge Development Centre Portharcourt to take part in the first edition of CoinFest Nigeria Hackathon. CoinFest Nigeria choice of Hackathon for day two of the conference was to engage blockchain developers across Nigeria to build and design blockchain based solutions that drive value back to society. Prior before the team was separated, an interesting session was held whereby participants were given the opportunity to pitch an idea of what they think can be built with the innovative blockchain technology. After several hours of building and hacking, Judges such as Roselyn Wanjiru, EOS Nairobi, Adedayo Adedapo Lead Support, Jelurida, and Faith Obafemi were ready to see the project and hear their pitches. All in all, there were five winners, the top three projects include. 1. Team ESUSU: created a blockchain integrated app that assists SMEs in accessing soft loans and save money without paying interest. 2. Team Bit Market: build a decentralized blockchain integrated agricultural commodities e-commerce platform that allows the purchase of goods and services using cryptocurrencies. 3. Team Remote Health Diagnosis: designed an app whereby patients can be easily diagnosed by doctors from the comfort of their home. 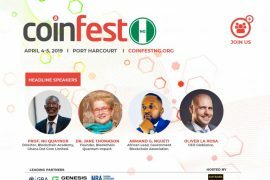 All in all CoinFest Nigeria 2019 was huge success. Thanks to our sponsors, strategic and media partners, for make it happens.